[165 Pages Report] The artificial intelligence (AI) in aviation market was valued at USD 112.3 Million in 2017 and is likely to reach USD 2,222.5 Million by 2025, at a CAGR of 46.65% during the forecast period. The base year considered for the study is 2017, and the forecast period is between 2018 and 2025. The major factors driving the growth of the AI in aviation market include the use of big data in the aerospace industry, significant increase in capital investments by aviation companies, and rising adoption of cloud-based applications and services in the aviation industry. The report aims at forecasting the market size and future growth potential of the AI in aviation market on the basis of offering, technology, application, and geographic region. 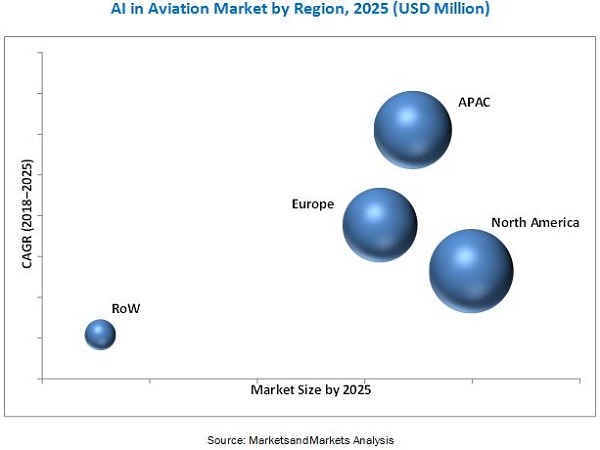 It aims at identifying the major market trends and factors driving or restraining the growth of the AI in aviation market and its various submarkets. Furthermore, the report analyzes opportunities in the market for stakeholders by identifying the high-growth segments of the AI in aviation market, strategically profiles key market players, and comprehensively analyzes their market size and core competencies in each segment. The research methodology used to estimate and forecast the AI in aviation market begins with obtaining data on key vendor revenues through secondary research. Some of the secondary sources referred to for this research include Association for the Advancement of Artificial Intelligence, European Association for Artificial Intelligence, Canadian Artificial Intelligence Association. The vendor offerings have also been taken into consideration to determine the market segmentation. The bottom-up procedure has been employed to arrive at the overall size of the AI in aviation market from the revenues of the key players. After arriving at the overall market size, the total market has been split into several segments, which have then been verified through primary research by conducting extensive interviews with key people such as CEOs, VPs, directors, and executives. The market breakdown and data triangulation procedure have been employed to complete the overall market engineering process and arrive at the exact statistics for all segments. The breakdown of primary participants has been depicted in the following figure. 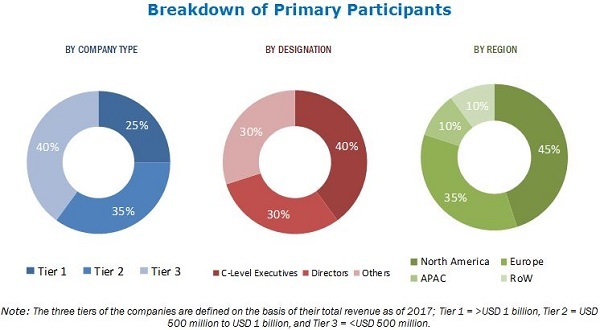 The AI in aviation market ecosystem comprises companies such as Intel (US), NVIDIA (US), IBM (US), Micron (US), Samsung (South Korea), Xilinx (US), Amazon (US), Microsoft (US), Airbus (France), Boeing (US), General Electric (US), Thales (France), Lockheed Martin (US), and Garmin (US). The global artificial intelligence (AI) in aviation market is expected to be valued at USD 152.4 Million in 2018 and is likely to reach USD 2,222.5 Million by 2025, at a CAGR of 46.65% between 2018 and 2025. The major factors driving the growth of the AI in aviation market include the use of big data in the aerospace industry, significant increase in capital investments by aviation companies, and rising adoption of cloud-based applications and services in the aviation industry. In this report, the AI in aviation market has been segmented on the basis of technology, offering, application, and geography. Among all offerings, software holds the largest share of the overall AI in aviation market. This is owing to the developments in AI software for applications such as surveillance, flight operations, and airport operations. AI systems comprise software including application program interfaces, such as language, speech, vision, and sensor data, along with machine learning algorithms, to realize various applications in the aviation industry. Among all technologies, machine learning is likely to hold the largest share of the AI in aviation market during forecast period. Machine learning’s ability to collect and handle big data, along with its increased ability to perform previously impossible calculations, is fueling the growth of the market for machine learning. Among all applications, virtual assistants are expected to hold the largest share of the AI in aviation market throughout the forecast period. AI-based virtual assistants help airline companies improve their productivity and increase the efficiency of pilots by reducing recurring works, such as changing radio channels, reading wind forecasts, and providing position information on requests. These recurring jobs are taken care by the AI-enabled virtual assistants. Garmin (US) offers AI-enabled audio panels that help pilots operate these panels without taking their hands off the controls. Furthermore, virtual assistants also help airline companies improve customer services. They can provide instant answers to simple questions pertaining to flight status and services/offerings (audio, video, Wi-Fi), while customer representatives can attend to more important issues, enhancing customer experience. Virtual assistants are used at several airports to serve air travelers. For example, a virtual assistant is placed in the security line at the Barcelona (Spain) airport to help passengers with the security instructions and steps required to check in. Considering the benefits offered by these systems, a large-scale adoption of virtual assistants by airline companies is expected in the near future. The AI in aviation market in APAC is expected to grow at a high rate between 2018 and 2025. This growth can be attributed to the huge demand for AI technologies from countries such as China and Japan to increase efficiency of their aviation sector. For example, the Alibaba Group Holding Limited (China) has announced to provide AI-based solutions to avoid congestion at the Beijing Airport. These solutions would help pilots find parking slot for their aircraft easily. In addition, the increasing adoption of machine learning and NLP technologies for virtual assistance and training applications in the aviation sector is driving the growth of the market in APAC. Limited number of experts in AI is restricting the growth of the AI in aviation market. Some of the key players operating in the AI in aviation market are Intel (US), NVIDIA (US), IBM (US), Micron (US), Samsung (South Korea), Xilinx (US), Amazon (US), Microsoft (US), Airbus (France), Boeing (US), General Electric (US), Thales (France), Lockheed Martin (US), and Garmin (US).